The specifi c theory of operation and details of instruments is covered in the Pilot’s Handbook of Aeronautical Knowledge, and is a prerequisite to this section on fl ight instruments. The altimeter is the most important fl ight instrument and should be on every WSC aircraft. It is used to maintain the proper altitude at airports, during cruise, and provides other aircraft position information for the safety of all. The vertical speed indicator (VSI) is one tool to assist the pilot with the performance of the aircraft. The airspeed indicator (ASI) is used to optimize performance of the aircraft, compare predicted to actual performance, and to operate within the limitations of the aircraft. A global positioning system (GPS) is typically used as a navigation and fl ight aid for most WSC aircraft. A magnetic compass is commonly used as a primary navigation system or as a backup when a GPS system is used. There is a variety of engine instruments that are used. The most basic is the engine rpm, which determines the power of the engine. Specifi c engine instruments are discussed in the powerplant section. Instrument panels vary greatly from the basic to the complex. 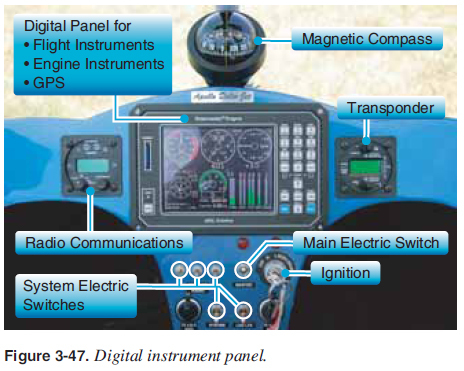 Figure 3-44 depicts a standard instrument panel supplied by the manufacturer with a portable GPS added in the middle. Electrical components are neatly arranged along the top. 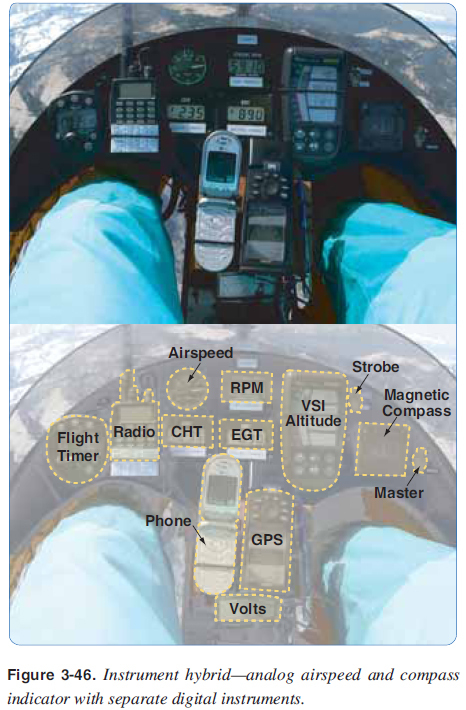 Large analog airspeed (left) and altitude (right) fl ight instruments are installed in the middle with the portable GPS installed between the two. The bottom stack consists of the basic engine instruments for a simple two-stroke aircooled engine: RPM for power (top), CHT (middle) and EGT (bottom). A more advanced analog panel with a user radio and GPS added is shown in Figure 3-45. Airspeed, vertical speed indicator, and altitude large fl ight instruments are along the top. A navigational gyro is in the middle of the panel. The bottom row consists of four-stroke engine instruments, electrical and remote fuel gauge. The user installed radio and GPS complete a well equipped instrument panel. A hybrid panel of analog, digital, and portable instruments is shown in Figure 3-46.